Last week I ordered these super cute Yo Gabba Gabba bath squirt toys for JD and they finally came in the mail! I received a text message from hubby yesterday letting me know that I got a package from Amazon, I told him he could open it and sure enough the minute JD saw YGG he went crazy (according to hubby), he loved them. Well, when I got home last night I asked JD if he liked his YGG squirt toys (that mommy got him) and he said “UmHmmm”, oh and then proceeded to tell me his “Papa” got them for him; now I know, he who opens the box gets the credit! Squeeze 'em! Fill 'em! Squirt 'em! 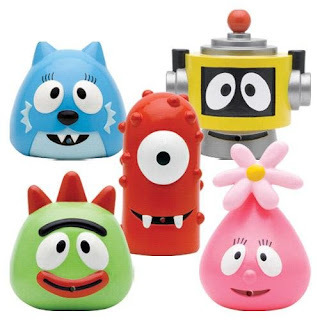 Yo Gabba Gabba Bath Time Squirters! Includes all 5 characters. aww these are soo cute!! !